Since 1925, on the last consecutive Wednesday and Thursday in July, Pony Penning is held on Chincoteague. 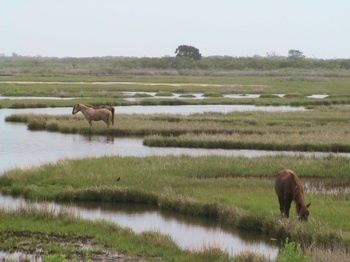 The herds on Assateague island are rounded up, and on Wednesday of Pony Penning week the ponies swim the channel from Assateague to Chincoteague. 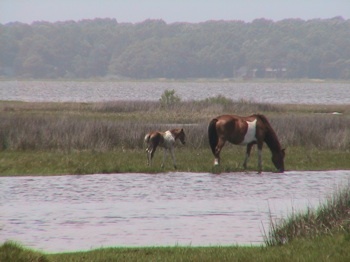 The ponies are held in a pen at the carnival grounds on Chincoteague until they swim back on Friday morning. On Thursday, an auction of most of the foals is held with a few kept as future breeding stock. 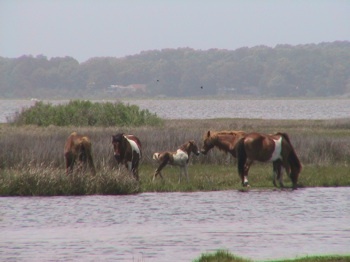 The proceeds of the auction are used to care for the feral ponies and finance Chincoteague’s fire department. Additional roundups are held in the spring and fall for an examination by a veterinarian, vaccinations, de-worming, and hoof trimming. Along with the fall roundup is an informal sale of the foals born after Pony Penning, and the foals sold in July that were too young to be weaned are picked up by their owners.